A small town in the circle of Constance, Baden, Germany, at one time belonging to the landgraviate of Nellenburg. 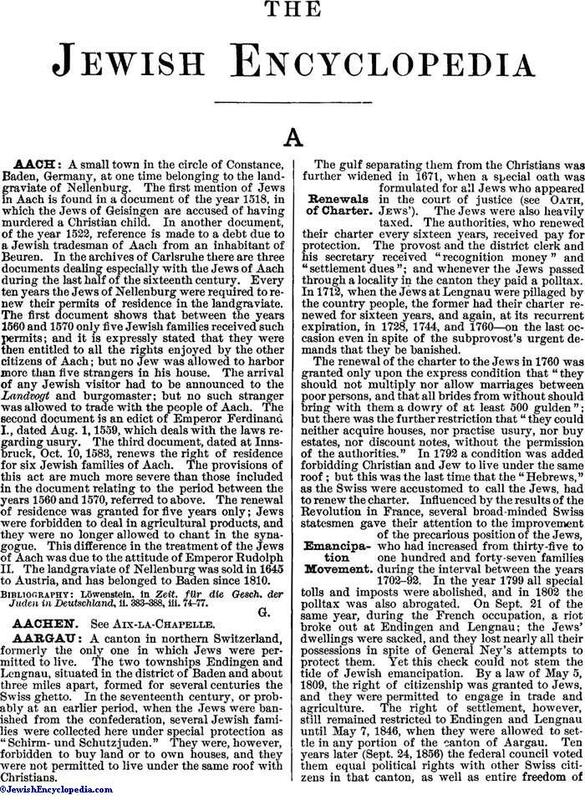 The first mention of Jews in Aach is found in a document of the year 1518, in which the Jews of Geisingen are accused of having murdered a Christian child. In another document, of the year 1522, reference is made to a debt due to a Jewish tradesman of Aach from an inhabitant of Beuren. In the archives of Carlsruhe there are three documents dealing especially with the Jews of Aach during the last half of the sixteenth century. Every ten years the Jews of Nellenburg were required to renew their permits of residence in the landgraviate. The first document shows that between the years 1560 and 1570 only five Jewish families received such permits; and it is expressly stated that they were then entitled to all the rights enjoyed by the other citizens of Aach; but no Jew was allowed to harbor more than five strangers in his house. The arrival of any Jewish visitor had to be announced to the Landvogt and burgomaster; but no such stranger was allowed to trade with the people of Aach. The second document is an edict of Emperor Ferdinand I., dated Aug. 1, 1559, which deals with the laws regarding usury. The third document, dated at Innsbruck, Oct. 10, 1583, renews the right of residence for six Jewish families of Aach. The provisions of this act are much more severe than those included in the document relating to the period between the years 1560 and 1570, referred to above. The renewal of residence was granted for five years only; Jews were forbidden to deal in agricultural products, and they were no longer allowed to chant in the synagogue. This difference in the treatment of the Jews of Aach was due to the attitude of Emperor Rudolph II. The landgraviate of Nellenburg was sold in 1645 to Austria, and has belonged to Baden since 1810. Löwenstein, in Zeit. für die Gesch. der Juden in Deutschland, ii. 383-388, iii. 74-77.